Five players including Riley Ferguson from Memphis, Ito Smith from Southern Miss, Logan Woodside from Toledo, Kameron Kelly from San Diego State, and Jonathan Barnes from Louisiana Tech have been selected as the College Sports Journal All-Stars for the week ending September 17th, 2017 from the NCAA Division I FBS Group of Five schools. Riley Ferguson • Sr. • QB • Memphis • Matthews, N.C.
Ferguson completed 23 of 38 passes for 398 yards and six touchdowns to lead Memphis to a 48-45 win against No. 25 UCLA. He threw four touchdown passes in the first half and threw the game-winning touchdown pass in the fourth quarter after UCLA had taken the lead. The 398-yard game was his eighth 300-yard passing outing of his 15-game-old Memphis career and his six touchdown passes on Saturday tied his career-best (vs Bowling Green last year). 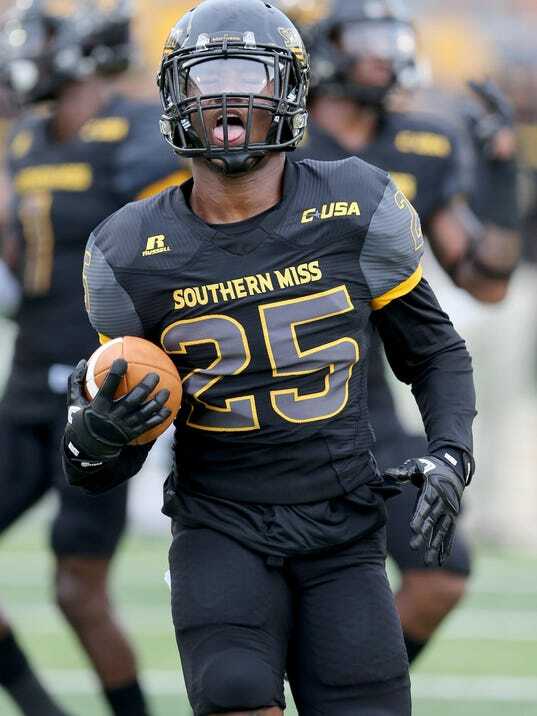 Ito Smith, Sr. RB, Southern Miss, Mobile, Ala.
Smith recorded his first career 200-yard rushing contest in the team’s win at ULM, finishing with a career-best 219 yards on 27 carries, marking the first 200-yard rushing game for Southern Miss since Jalen Richard tallied 230 at Texas State on Sept. 19, 2015. Smith also registered his 31st career rushing touchdown, moving him into fourth place by himself on the school’s career TD list, as he passed both Derrick Nix (1998-2000, 02) and Ben Garry (1974-77). Saturday was also his first 100-yard rushing performance of the season and 17th of his career, which tied him with Ben Garry for second on the school chart. In addition, Smith notched three catches for 13 yards and one kickoff return for 22 yards to compile 254 all-purpose yards. That total put him over the 5,000 all-purpose yard mark with 5,093, moving him into second place behind Damion Fletcher (6,253) and making him one of two Golden Eagles to amass more than 5,000 all-purpose yards in their careers. Logan Woodside, Sr., QB, Toledo, Frankfort, Ky.
Woodside threw for 458 yards and six TDs to rally Toledo from 21 points down in a 54-51 win over Tulsa. Woodside completed 22-of-33 passes, averaging almost 21 yards per completion. He threw for TD passes of 60, 26, 81, 15, 49 and 74 yards. Woodside now has 7,636 career passing yards and moved into third place on Toledo’s all-time passing yardage list, passing Gene Swick (1972-75, 7,266 yards). His 458 passing yards are third-most in a single game in Toledo history; he also holds spots number one and five (vs. BYU in2016 and vs. Ohio in 2016, respectively). Woodside’s six touchdown passes are tied for the most in a single game in Toledo history. Bruce Gradkowski achieved that feat twice (2003 vs. Buffalo, 2004 vs. Ball State). That total is tied for the fourth-most in a single game in MAC history. In the second half, Woodside threw for 294 yards, third-most in a half in Toledo history and the most ever in the second half. Kameron Kelly, Sr., CB, San Diego State, Murphy, Tex. Kelly totaled six tackles (five solo), 2.0 sacks, 2.0 tackles for loss, one forced fumble and an interception in San Diego State’s win over No. 19 Stanford. He forced a fumble late in the second quarter, stopping a Cardinal drive. He also intercepted a pass on Stanford’s final drive, preserving the victory for SDSU. Overall, he helped force Stanford’s offense into six three-and-out series, three turnovers and limit it to just 18:46 in time of possession. The time of possession number for Stanford was its lowest since at least 1996. 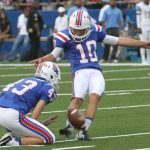 Barnes once again came through in the clutch for Louisiana Tech on Saturday night when his 21-yard game-winning field goal with two seconds left in the game gave the Bulldogs a 23-22 road victory over WKU. The 21-yarder to clinch the victory was Barnes’ third field goal of the game as the senior was a perfect 3-for-3 on the night with kicks of 33, 36 and 21 yards. Barnes also nailed both of his PATs in the game. With his game-winning field goal against WKU, Barnes is now a perfect 7-for-7 in his career on field goals attempted in the final two minutes of the fourth quarter or overtime. 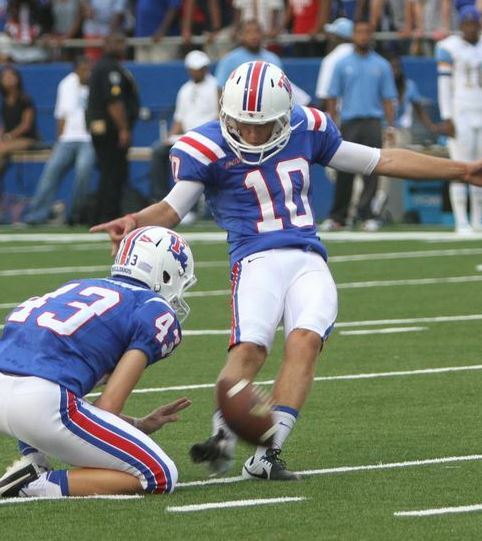 He is three field goals away from tying the Louisiana Tech record for field goals made in a career.